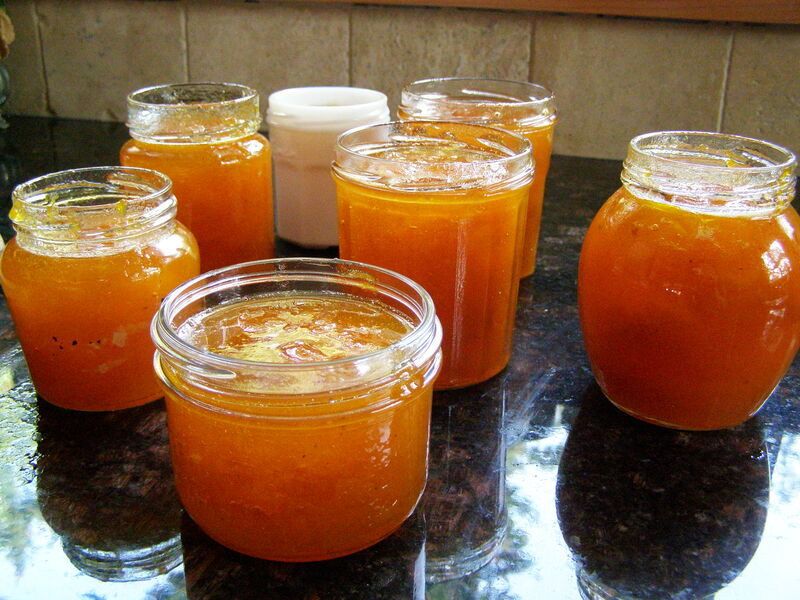 Mamie Odette made apricot jam every year, and this right into her seventies and even maybe eighties. This is the only jam she would make, she thought that it was the only jam worth making at home. I don’t quite agree with that, but the fact is, apricot jam is the best, and besides it is the easiest jam to make. It does not require a lot of time either. 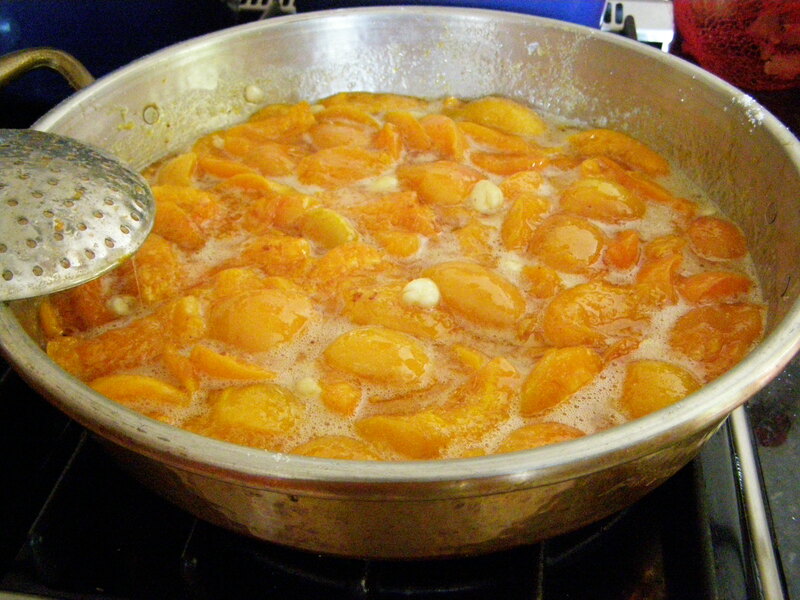 Find two kilograms of ripe apricots, wash them, open them, remove the pits and cut them in quarters in a very large jam making pan or your two largest frying pans. Add 8 cups sugar. Leave on the counter. 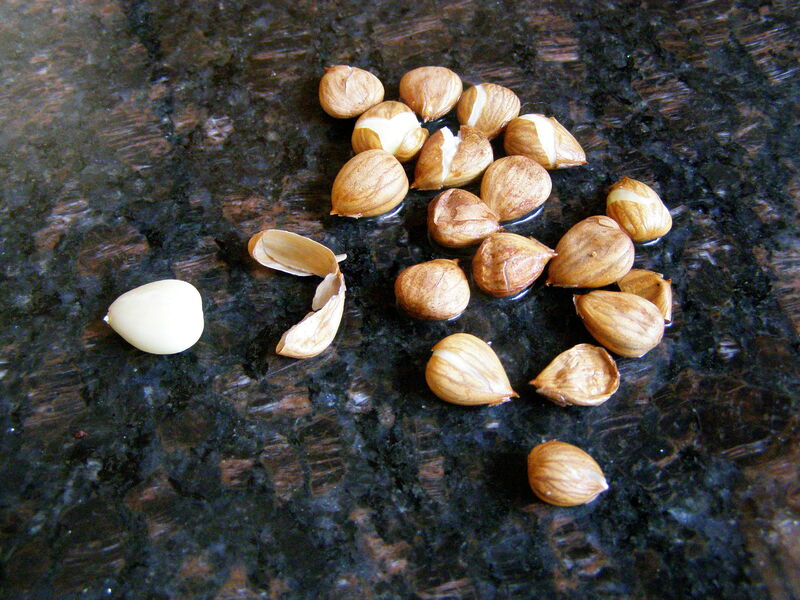 Meanwhile, crack the pits with a hammer gently, and extract the almonds inside. You need about 16 whole almonds. I destroyed quite a few, but still manage to save 16. Boil them in water for 2 minutes and peel them. The bitter peels will come off easy. If you don’t peel them, the jam will be more bitter. Add the almond to the apricots and also a pinch of cinnamon, a pinch of ground clove and a pinch of ground anise seeds. Start cooking uncovered on medium heat stirring as needed so it does not burn. Skim the foam frequently. Place a small saucer in the freezer. Keep cooking for at least 20 minutes, likely longer. When it feels like the jam might set, try putting about a spoonful on the saucer and putting it back in the freezer for a couple minutes. If it sets, you are ready to add the juice of half a lemon, turn the heat off. Wait five minutes and fill clean jars, each jar should have at least one almond. This is enough jam for about eight jam-size Mason jars but I just used recycled jars with interesting shapes. Sterilize if you are making a lot, otherwise just keep them in the fridge until you need them. There is enough sugar that the jam will not mold if it is not refrigerated for a few days. This entry was posted in Stuff and tagged Apricot jam, confiture d abricots, cooking, food, recipe, recipes. Bookmark the permalink. I never knew about the pit either, but it looks fabulous. A few years ago I’d have to pay someone for this inrfomatoin. Wow! that looks fantastic and I never knew about the pit. It’s my favorite jam (raspberry and blackberry not too far behind). If I’m not too late in the season I’m going out to look for apricots! This is very interesting. In all my years I’ve never heard of using the pit before. I remember being told it was poison. I’m sure it will leave a lot of flavor. yes, it is true, it is poison, cyanide, but very small amount and you are not to eat it. Safe enough in the jam, generations have done it that way.